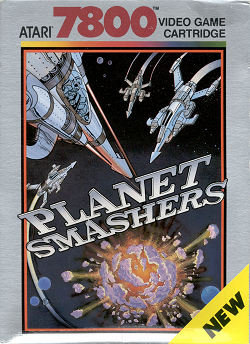 In this review, things get warped as we play the Atari 7800 game, Planet Smashers. We find out how well this top down shooter plays. This game was released in 1989. It is one of those games where if you’ve played games like Xevious, Galaga, or Galaxian, then you’ll already be very familiar with how this game plays. Like many games before this one, you play as a single ship. You are fighting against a constant onslaught of alien invaders bent on destroying Earth. If you fail, Earth will be subject to total annihilation – which raises the question on why send a single ship in the first place instead of an entire fleet, but that’s beside the point. While this game does take on a very similar style of play to those that came before it, this game does boast some interesting features. The most apparent new feature for this game is the fact that you are able to move up and down instead of the very limited side to side motion of previous games. Your movement is limited to the bottom third of the screen, but it is still an improvement over the previously mentioned games. This added feature gives you more methods of either evading enemy fire, evading enemy ships or asteroids, or giving you a better chance at obtaining items. This brings us to the second feature: items. Throughout the various rounds in this game, it is possible to pick up items. There are five different kinds of items to collect: W, C, S, blank, and a color. The W is an improvement to your weapon. You’ll start with a very basic weapon where you have to manually tap to fire. The first improvement allows yo to hold down the fire button for a regular firing pattern to make the game a little easier. The next improvement is the same firing pattern as the first, only you’ll be shooting plus signs. These cause more damage and improves the chances of connecting a shot with your target. After that, you’ll upgrade back to the smaller shot, only you’ll be able to fire at a more rapid pace. After that, you go back and forth between the two shots, improving how quickly rapid-fire happens as you go along. The C is power to your cloak. Many enemies try to take you out on the way through. If you tap your cloak, you’ll get an outline of your ship and enemies won’t see you. This makes it easier to just blast them away as ships won’t fire and they won’t be reacting to your presence at all. For every dot of energy you get, you can stay cloaked for longer periods of time. Very useful for helping your survival chances against bosses. The S is recharging your shield. Unlike previous games, you can take more than one hit. Your shield can take 5 hits before failing. Take a 6th hit and your ship will blow up, causing you to lose a life. Fortunately, if you happen to come across an S item, you’ll be able to recharge your shield by one dot. The blank item is simply something you can collect for points. It is an indication that you have collected everything you can for that level in terms of power-ups. The final item is the color item. This is a warp code icon. If you shoot the icon, you’ll be able to cycle the color by one. In total, there are five colors to choose from: purple, yellow, green, blue, and red. If you are wondering what the colors indicate, they correspond with the three black boxes on the bottom left corner. The idea is that you need to get the three colors that allow you to warp straight to the boss of the level. If you get a correct color, but it isn’t the next color in the sequence, the color will flash at the appropriate part of the code, but you won’t get anything other then that hint. If you get all three colors in the correct order, you’ll warp straight to the boss as soon as the last baddie leaves the screen at that moment. Failing to get this, I’ve presumed that you need to then go by the distance gauge. If you manage to fill this up, then you’ll probably get to the stage boss just the same. I never got this far in a stage and I always ended up triggering the warp before I filled up the distance, so I don’t know for sure if this is the case. This brings us to another improvement to the genre on an Atari system: boss fights. In other games before this one, all you had to do was destroy all of the enemies in a swarm. This time around, you get to take on bosses. Up to now for us, we have never really seen much of this on an Atari system. The boss fights are quite difficult. If you die during the boss fight (which we always ended up doing), the boss ship will zip past you and the fight will be over. You’ll get to then take on the next stage, but with one less life. To make things even more complex, you’ll also have an Earth shield. For every shot you miss or every enemy you let fly by you, Earth takes on damage. It takes a lot to take out Earth, but it is not an unlimited supply. Chances are, though, you’ll die before Earth gets polished off completely. So, for many players, the Earth shield won’t likely be a factor. Standing in your way are, of course, the hoards of enemies trying to take you out. There are small asteroids and big asteroids that will fly at you at various speeds. There are those round flashing enemies that fire out shots at various rates. There are the two different wide ships that fire numerous directed shots at you. Destroying them unveils either a warp color or an item. There are the ships that look like they have a flashing block on the front. There are the tadpole flashing aliens. In later levels, there are rounded ships that are not only difficult to take out, but also fire quicker shots at you. When you do lose (as most, if not, all players will no doubt do) all of your lives, you’ll get treated to a stark message that you have failed in your mission and Earth is going to be annihilated. Probably the only thing that is propping this game up is the features and variety of enemies you encounter. While this does make up a good portion of the game, there are other things to consider as well. Just two years earlier, the NES console is already boasting the Gradius series through the game Life Force. The features in that game makes this game look like a pale imitation by comparison. One thing these games have a known problem throughout the years for is difficulty. This video of another game helped make this sort of thing famous. While the difficulty of this game isn’t that asinine, it’s a nut this game was unable to really crack. Beating the bosses proved to be an insurmountable task despite being able to exact a fair bit of damage to some of them. To make matters worse, even if I was able to beat one of them, the earth shield was starting to get low anyway by the end of the third round. At that point, I find myself putting down the controller and saying, “forget it”. What is positive about this game is that it is the most evolved game I’ve played so far on the Atari 7800 console. It does give me the impression that progress has been made in this genre on this console. It, unfortunately, comes off as a case of too little, too late. If it, however, possible to see that effort has been made in the first place. Generally speaking, this game does show progress being made on an Atari system in the realm of top down shooters. Unfortunately, like a number of other Atari 7800 games such as Scrapyard Dog (vs. Super Mario Bros 2) and Xenophobe (vs. Mega Man 2), it ends up being surpassed by efforts being made on the NES. It’s not to say that effort isn’t being made, it’s just that other games on other home consoles simply outshine these efforts. These kinds of games are known for their difficulty that has a tendency to put off new gamers to the genre, and this game is no exception. While the boss fights do break up gameplay nicely, it’s, again, too little, too late. Graphics is a surprisingly sore spot for this game. Credit where credit is due belongs to the designs of the enemies. The nice variety really softens the blow of bland graphics throughout the game. There is always something new to see before your ship blows up for the final time. Having said that, all you get is the stark black background with the occasional pixel that represents stars flying by. Where the game gets particularly cringe-worthy is the game over sequence with the plain text and the weirdly slashing earth. Its ultimately not the finest hour for 80s game graphics, that’s for sure. The audio has been a sore spot for Atari 7800 games, and this game doesn’t fare much better. The sound effects are pretty average. There is no music during game play and the game over sequence features some pretty bad music. I know it’s supposed to be very sombre music, but it ends up being pretty lousy in the end. Overall, this game gives some of the most evolved features we’ve seen yet for a top down shooter on an Atari system. The shield and the powering up weapon, not to mention the warp color puzzle, really does put some dynamic stuff at play. Unfortunately, the steep difficulty and stiff competition from the NES system both conspire to hold this game back by quite a bit. While the enemy design does spruce the visual candy up by a fair bit, the stark black background and cringe-worthy ending ends up overshadowing these efforts by quite a bit. The audio, which is rarely mind-blowing on this system in the first place, didn’t give this game any favors. As a result, this game is pretty dated. A game that you can play a few times to satisfy curiosity, but nothing much more then that. Furthest point in game: Died on the third boss fight. High score: 164,875 points.